These are some of the water gun and water blasters that have helped revolutionize the world of water warfare. Feel free to suggest other water blasters using the Submissions page; please include images (if available) as well as an explanation why you feel they should be included. 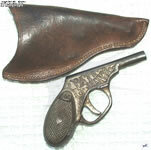 Patented June 30 1896 (Images provided by Phillip James): the USA Liquid Pistol may not necessarily be the first, but it is presently the oldest water gun that iSoaker.com knows about. Not shown in these images is the squeeze bulb and tubing that would attach to this pistol-shaped toy to allow it to shoot water. Patented in 1977: the Cosmic Liquidator is the oldest known water blaster that uses air pressure to generate a water stream. Its pressure tank, however, was separate and connected to the blaster part via a flexible piece of tubing. In the early 1980s, Entertech ruled the motorized water gun market with their realistic water blasters. At a time when Rambo movies were the rage and with ranges up to 30', nearly every North American child longed for one of the series of water guns made by Entertech. The Aqua Force water gun by Ohio Art is not the first water gun with a separate reservoir, but it is the first one that featured a backpack reservoir (at least to our knowledge). The gun portion used a couple of ball-bearing valves and pump action to draw water from the reservoir and push it out of the nozzle. Stream power was dependant on the strength of the user, but the small nozzle size and finite output limited maximum range to approximately 30'. 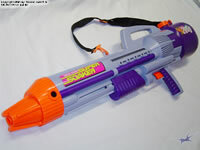 The Power Drencher (now known as the Super Soaker SS50) is the water blaster that revolutionized the face of water warfare. While not the first air-pressure water blaster, the Power Drencher placed the pressure chamber/reservoir atop the blaster, creating a visually distinct and better performing water blaster. Not only did the Power Drencher perform better than any of the motorized water guns available. 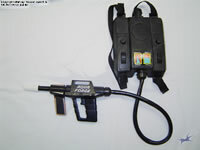 Additionally, the Power Drencher did not require any batteries and had mu ch more capacity than any of its rivals (apart from the Aqua Force water gun). Interestingly, then the Power Drencher was released in 1988, it gathered little attention. However, being rename to "Super Soaker" and having a more aggressive advertising campaign in 1989, the Super Soaker became THE toy of the summer, outselling virtually any other toy on the market and putting Super Soaker down into the history books. The Super Soaker SS 100 is the first water blaster to feature a separate pressure chamber for water on an air-pressure soaker. This change in design released in 1990 meant less pumping was required to achieve higher pressures and overall better performance. Additionally, the Super Soaker SS 100 could be refilled even when pressurized; the low pressure system in the reservoir reduced the need to tighten the reservoir onto the blaster as is needed on the Super Soaker SS 50 for it to perform. 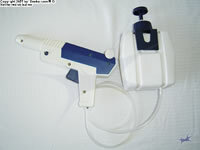 In 1996, when many had felt that the water blaster market had already peaked in terms of general design and performance, Larami Ltd. released the CPS 2000, the first of many new blasters using a rubber bladder as opposed to air pressure to provide the power behind the water stream. The CPS 2000 was by far the most powerful stock soaker ever made, able to lob 1L (~33oz.) of water anywhere within at least 50' of its user. Its power has given the CPS 2000 legendary status in the water warfare community. Four years after the release of the Super Soaker CPS 2000, Larami Ltd. unleashed the Super Soaker Monster XL onto the world. The Super Soaker Monster XL holds many firsts for a water blaster including being the largest single-piece water blaster ever made (even being listed in the Guinness Book of World Records), the first dual-chamber/dual-nozzle CPS water blaster, the first water blaster having a retractable bipod, the heaviest water blaster (dry weight), and the soaker with the most number of possible spray configurations. Unfortunately, the Monster XL's power felt somewhat lacking for a soaker of its size. However, it defintely ruled in terms of sheer intimidation. In 2003, a new toy company known as Buzz Bee Toys Inc. introduced their Hydro Power system in two water blasters: the Water Warriors Lightning and the Water Warriors Blazer. Akin to CPS, Hydro Power also derives its power from the elastic properties of rubber, but this time in the shape of a diaphragm chamber stretched over a holding bracket. While not quite as efficient as the true, but patented Super Soaker CPS bladders, the Water Warriors Hydro Power offers near CPS-type power though with more end-shot dropoff. 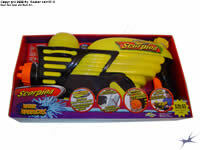 While not the first water blaster to feature a separate fan/blast-attack nozzle (the Max-D Secret Strike has that honour), the Super Soaker Flash Flood is the first water blaster to get it right, using a cylindrical CPS chamber as opposed to air pressure to provide power to its nozzles. 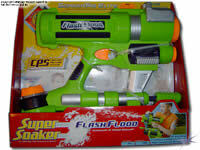 Released in 2005, the return of new CPS-based Super Soakers in compact forms had arrived. Though compared to its predacessors, the Flash Flood has limited power, it did offer a great amount of flexibility and is well balanced for a blaster of its size. In 2005, together with the Water Warriors Argon and Water Warriors Xenon, the Water Warriors Krypton used a novel split air/water pressurization scheme designated as Aqua Master Pre-Charger System by Buzz Bee Toys Inc. In this system, the pressure chamber has a sliding piston divider in it such that the pressurized air is pumped and stored in the rear of the chamber while water is pumped into the forward part of the chamber. The end result is CPS-like performance from an air-pressure-based water blaster. Unlike other air-pressure water blasters, the Aqua Master series does not have firing angle limitations and only requires a few pumps to reach maximum pressure. Unfortunately, the first release of the Krypton was extremely difficult to pump when fully pressurized, thus reducing its popularity. A later version released in 2006 had its pump resistance lowered a bit. 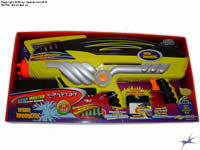 In 2006, Buzz Bee Toys Inc. released the Water Warriors Scorpion, the first water blaster featuring a motorized pump using a rechargable Ni-Cd battery pack that pressurized a Hydro Power diaphragm chamber. The end result was a blaster free from manual pumping but had stream performance on par with a Super Soaker CPS 1000. The primary downsides to this design were that the motor used was somewhat noisy when pumping and the blaster felt slightly bulky in size overall. 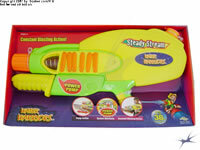 For 2007, Buzz Bee Toys Inc. released the Water Warriors Steady Stream, the first piston-based soaker to feature a spring-based pressure chamber. While firing occurs with each pump as is the case with other piston-based soakers, the spring absorbs some of the excess energy and allows the stream to continue for a second after pumping completes and/or during the pump-refill cycle. The end result is a piston soaker that has the ability to produce a continuous stream if one is pumping quickly enough. 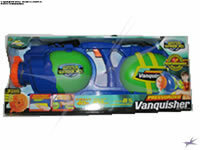 For 2010, Buzz Bee Toys Inc. released the Water Warriors Vanquisher, the first elastic-bladder based blaster featuring a dual-reservoir system for improved balance. Both chambers of the Water Warriors Vanquisher fill with water during filling through its reservoir opening thanks to tubes connecting the bottom and top of both tanks. As water is pulled from the reservoir into the internal bladder, the duel tanks equalize their water level accordingly. While well balanced, some found the positioning of the trigger area, which is closer to the top of the water blaster, to be somewhat unwieldy, negating the improved balance on this blaster.